Great Deal! This is an amazing way to gain thousands of airline miles and some free valuable Apple products, free trades; all without a hard inquiry on your credit record. If you have at least $10,000, don't turn down this amazing opportunity! 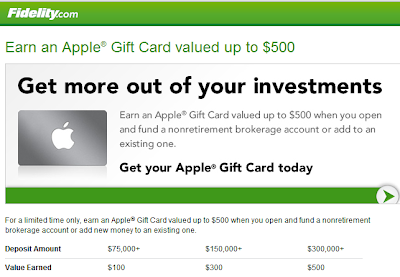 UPDATE 5/20/2012 FT members that have signed up for the Apple Promotion in April seem to be receiving their Gift Cards, even if they never received any emails from Fidelity on this promotion. UPDATE 5/7/2012 FT members are saying the cycling might be dead. I am in middle of cycling for the Apple Promotion. I will let you know of my results. Firstly, I will post my updated status; then I will tell you about the changes to the Fidelity Promotions along with a new promotion. From reading through the Flyertalk Fidelity thread with 235+ pages I learned that the double dip with more than one airline is probably dead. The promotions now state "Promotional offers are limited to one per individual per rolling 12 months." This is probably why I haven't received my last Delta miles. But no one knows for sure. Can one still take advantage of the Apple promotion while taking advantage of the airline promotion? You can see a comment below from a DS reader Piecerate, saying that he has been able to and is awaiting his gift card. All Fidelity offers for the airlines now state that you can be an existing Fidelity member. In the past, this was only applicable to Delta, now it is the case for American Airlines and United as well. You can take advantage of a new promotion every 12 months. This promotional offer is only available to new or existing Fidelity brokerage account customers opening or depositing new assets into a joint or individual nonretirement Fidelity Account®. This offer expires September 30, 2012, and is not transferable or valid in conjunction with any other Fidelity promotional offer. Fidelity Investments reserves the right to modify, change, or alter the terms and conditions of the promotional offer in its sole discretion at any time. 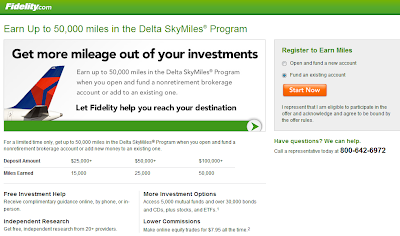 Fidelity Investments may terminate this promotional offer at any time. Other terms and conditions may apply. The promotion is not available for business accounts, trust accounts, retirement accounts including, among others, Fidelity IRA, Roth IRA, SEP, and SIMPLE accounts; 401(k) and 403(b) workplace retirement plans; fiduciary accounts (including custodial accounts, estate accounts); college investment trust accounts; 529 college savings plan accounts; annuities; Fidelity accounts managed by Strategic Advisers, Inc. (for example, Portfolio Advisory Services); Institutional Wealth Services (IWS) clients; and clients of registered investment advisors working with Fidelity Investments. Offer not valid for government officials, candidates for federal, state, or local office, as well as state employees and employees of municipalities, commissions, agencies, public universities and health care programs, or any other public entity that can influence decisions involving Fidelity as a service provider to that public entity; union officials or employees; non-U.S. residents or persons and members of their immediate families, and households affiliated with or employed by FINRA or its member firms; Fidelity or its affiliates; a securities exchange or its members, or the media. Public officials or candidates for office may be subject to state or local gift laws. Transferred assets will be valued, for the purposes of determining eligibility for this promotional offer, at the close of business Eastern time on the business day or next business day, if on a weekend day or holiday, following receipt by Fidelity Investments of the assets into the account that is eligible for the promotional offer. Funding must come from an external, non-Fidelity source via any standard monetary transfer method (a standard Transfer of Assets form, check, electronic funds transfer, ADM deposit, etc.). 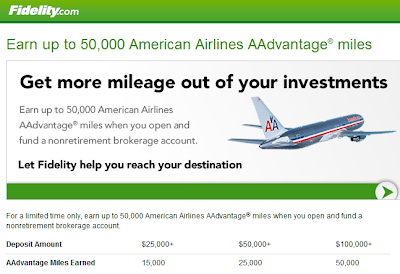 Please allow eight weeks from the funding of the eligible account, with the qualifying dollar amount of assets, for American Airlines AAdvantage® miles to be posted to your AAdvantage® account. Your Fidelity Account® must remain open with the qualifying funding for six months from the date that the qualifying assets are first received in the eligible account. New accounts must be opened within 30 days of registering for the offer. 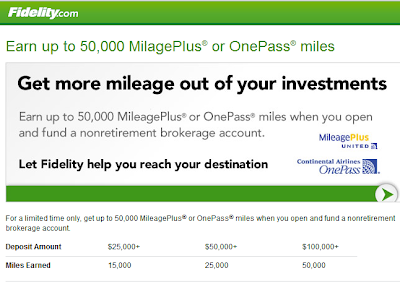 Additional deposits to the eligible Fidelity account may earn you a higher mileage award provided the result is that the cumulative assets meet or exceed the next eligibility tier (up to a maximum of 50,000 AAdvantage® miles). For new accounts, initial and subsequent deposits must be made within 90 days of Fidelity account opening. For new money deposited into existing accounts, all deposits must be made within 90 days of registering for the offer. This promotional offer is only available to new or existing Fidelity brokerage account customers opening or depositing new assets into a joint or individual nonretirement Fidelity Account®. This offer expires October 1, 2014, and it is not transferable or valid in conjunction with any other Fidelity promotional offer. Fidelity Investments reserves the right to modify, change, or alter the terms and conditions of the promotional offer in its sole discretion at any time. 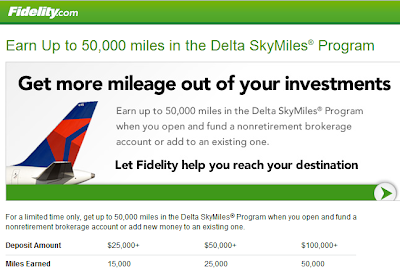 Fidelity Investments may terminate this promotional offer at any time. Other terms and conditions may apply. The promotion is not available for business accounts, trust accounts, retirement accounts including, among others, Fidelity IRA, Roth IRA, SEP and SIMPLE accounts; 401(k) and 403(b) workplace retirement plans; fiduciary accounts (including custodial accounts and estate accounts); college investment trust accounts; 529 college savings plan accounts; annuities; Fidelity accounts managed by Strategic Advisers, Inc. (for example Portfolio Advisory Services); Institutional Weath Services (IWS) clients; and clients of registered investment advisors working with Fidelity Investments. Offer not valid for government officials, candidates for federal, state or local office, as well as state employees and employees of municipalities, commissions, agencies, public universities and health care programs, or any other public entity that can influence decisions involving Fidelity as a service provider to that public entity; union officials or employees, non-U.S. residents or persons and members of their immediate families and households affiliated with or employed by FINRA or its member firms, Fidelity or its affiliates, a securities exchange or its members, or the media. Public officials or candidates for office may be subject to state or local gift laws. Transferred assets will be valued, for the purposes of determining eligibility for this promotional offer, at the close of business Eastern time on the business day or next business day, if on a weekend day or holiday, following receipt by Fidelity Investments of the assets into the account that is eligible for the promotional offer. Funding must come from an external, non-Fidelity source via any standard monetary transfer method (a standard Transfer of Assets form, check, electronic funds transfer, ADM deposit, etc.). Your Fidelity account must remain open with the qualifying funding for six months from the date that the qualifying assets are first received in the eligible account. New accounts must be opened within 30 days of registering for the offer. Additional deposits to the eligible Fidelity account may earn you a higher mileage award provided the result is that the cumulative assets meet or exceed the next eligibility tier (up to a maximum of 50,000 miles). For new accounts, initial and subsequent deposits must be made within 90 days of Fidelity account opening. For new money deposited into existing accounts, all deposits must be made within 90 days of registering for the offer. may terminate this promotional offer at any time. Other terms and conditions may apply. that public entity; union officials or employees; non-U.S. residents or persons and members of their immediate families and households affiliated with or employed by FINRA or its member firms, Fidelity or its affiliates, a securities exchange or its members, or the media. Public officials or candidates for office may be subject to state or local gift laws. first received in the eligible account. New accounts must be opened within 30 days of registering for the offer. Additional deposits to the eligible Fidelity account may earn you a higher mileage award provided the result is that cumulative new assets meet or exceed the next eligibility tier (up to a maximum of 50,000 miles). For new accounts, initial and subsequent deposits must be made within 90 days of Fidelity account opening. For new money deposited into existing accounts, all deposits must be made within 90 days of registering for the offer. Let's say you are signing up for the Delta promotion, these are the steps you will take. Click on "Fund an existing account" and click on the "Start Now" button. 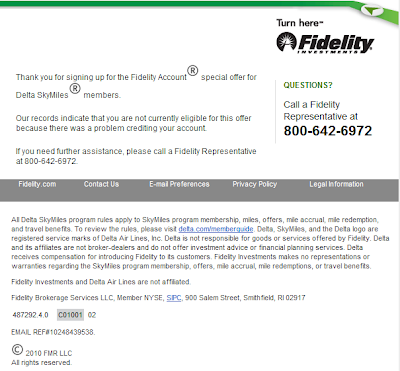 Fidelity Account Number and lastly your Delta Sky Miles Account Number. Click Submit to verify information is correct. Click on "Fund my Account"
Log In to your Fidelity Account and click "Log In"
Click on "Accounts & Trade" and then "Transfer Money/Shares"
Now you are going to choose where you want to transfer the money from. Under the "From" field, choose "A Bank Account" and under the "To" field choose your Fidelity Account. On the next screen make sure your bank or institution is selected and click on the "next" button. to transfer and then click on the "Submit" button. Verify that all the information is correct then click on the "Submit" button. You may want to keep a record of the transaction confirmation number. Fidelity is offering an Apple Gift Card up to $500 when you fund a new or existing Fidelity Brokerage Individual or Joint Account. Receive an Apple Gift Card valued at $100 (for deposits of $75,000), $300 (for deposits of $150,000) or $500 (for deposits of $300,000). You must complete the transferring within 30 days of signing up for the Apple promotion. If you only have $25,000 that you are cycling, you can choose to do the cycling before you actually sign up for the Apple promotion. Because $25,000 will need to be cycled 12 times in order to receive the full amount of $500. I have cycled $25,000 four times to receive a $100 Gift Card. The terms mentioned that this promotion is limited to one person per household, but Flyertalk members have said that they have been able to receive a Gift Card for them and their spouse. The Apple® Gift Card can be redeemed at any Apple Store.® This promotional offer is only available to new or existing Fidelity brokerage account customers opening or depositing new assets into a nonretirement Fidelity Account® (individual or joint). Trusts, business accounts, Fidelity IRAs (or other Fidelity retirement account registrations), fiduciary accounts (including custodial and estate accounts), college investment trust accounts, 529 college savings plan accounts, and annuities are not eligible for this offer. Funding must come from an external, non-Fidelity source via any standard monetary transfer method (a standard Transfer of Assets form, check, electronic funds transfer, ADM deposit, etc.). New accounts or deposits into existing accounts must be funded within 30 days of registration. This offer expires on June 30, 2012, and is not transferable or valid in conjunction with any other Fidelity promotional offer. Accounts must be opened by June 30, 2012. Offers are not valid for non-U.S. residents; Stock Plan Services accounts; Fidelity accounts managed by Strategic Advisers, Inc. (for example, Portfolio Advisory Services); clients of registered investment advisors working with Fidelity Investment; persons affiliated with FINRA; or employees of Fidelity, its affiliates, and members of their immediate families and households, a securities exchange or its members, or the media. 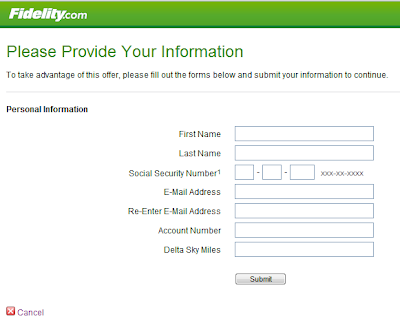 The following persons are not eligible for this offer: government officials, including state and local office holders; candidates for state and local office; union officials and/or union employees, as well as state employees and employees of municipalities, commissions, agencies, public universities and health care programs, or any other public entity that can influence decisions involving Fidelity as a service provider to that public entity. The recipients of the Gift Card acknowledge that they are permitted by their respective state or local gift laws to accept this card. Fidelity reserves the right to modify, change, or alter the terms and conditions of this promotional offer, or terminate this offer, at any time. This offer is valid for new or existing Fidelity customers. In order to receive the free trades, you must designate an existing eligible Fidelity IRA or brokerage account or open and fund a new eligible Fidelity IRA or brokerage account. Accounts receiving $50,000 to $99,999 will receive 100 free trades; accounts receiving over $100,000 will receive 200 free trades. Trades must be used within 90 calendar days of being credited to the customer's account. Commission-free trades must be designated to the one account receiving the qualifying assets or amount, and are limited to online domestic equities and options. Options trades are limited to 20 contracts or less per trade; for orders beyond these limitations standard commission rates apply to the entire order. You will not receive cash compensation for any unused commission-free trades; unused trades expire worthless. Offer is nontransferable, limited to one per household per year, and may not be combined with other offers. Account holders must maintain a minimum account balance of $50,000 for the 100 free trade offer or $100,000 for the 200 free trade offer (minus any losses related to trading or market volatility) for at least nine months from the date on which the trades are credited to the account, otherwise commission charges may be incurred retroactively on free trade executions based on the customer's applicable commission rate under Fidelity's Commission & Fee Schedule. Funding must come from an external, non-Fidelity source via any standard monetary transfer method (a standard Transfer of Assets form, check, electronic funds transfer, ADM deposit, etc. ); rollovers from a former employer's Fidelity-recordkept workplace savings plan are treated as coming from an external source for purposes of this offer. Customers must register at Fidelity.com/200free. New accounts must be opened and funded within 30 days of registration. Offer registration expires December 31, 2012. Cash, eligible securities, and/or margin debit balance transfers from multiple sources will be aggregated to determine total account funding; assets will be valued at the time Fidelity receives them. Allow up to seven business days for assets to be registered in the system. This Free Trade offer is valid for nonretirement (individual or joint) or Fidelity IRA (rollover IRA, traditional IRA, inherited IRA, Roth IRA, SEP-IRA) accounts in which individual security trading is not prohibited and which meet the minimum account opening or funding requirements for this offer. Offers are not valid for non-U.S. residents, Stock Plan Services accounts, PAS accounts, clients of registered investment advisors working with Fidelity Investments, persons affiliated with FINRA, or employees of Fidelity, its affiliates, and members of their immediate families and households. The following persons are not eligible for this offer: government officials, including state and local office holders; candidates for state and local office; union officials and/or union employees; and state employees and employees of municipalities, commissions, agencies, public universities, and health care programs; or any other public entity that can influence decisions involving Fidelity as a service provider to that public entity. 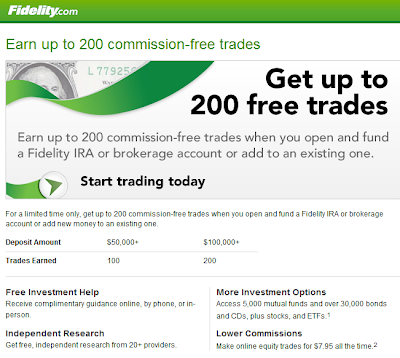 Fidelity reserves the right to terminate this offer at any time. Here's my experience. I signed up, funded the account, got my AA miles, and then signed up for Delta. I got an email stating I was ineligible for the Delta promo. I called but had no luck trying to get them to allow it. I then tried to get the the free trades promo. No luck. I have now signed up for the apple card. So far so good. I called Fidelity and was told I'm signed up and should be getting the card. I'll keep my fingers crossed until it arrives. You win some you lose some. But talk about easy miles! @Piecerate Thank you soooo much for the update. So it looks like that right now the only other promo you can double dip with is the Apple promo. I am in middle of cycling for the Apple Gift Card, so I will make sure to sign up then. By the way, the general rule when you sign up for more than one promo is not to call Fidelity about it. Because it's not according to their terms and conditions and we don't want to make them aware that all of us are trying to get more than one promo at a time. If you received the Delta email recently, then its a no go. But if it was a while ago then its ok. I had also gotten such an email but received the miles anyways. But I did this promo for myself a while ago. Thanks so much for this new info. !